For those of you not in the know, at the beginning of each month we send out a newsletter to all members of the CFZ. 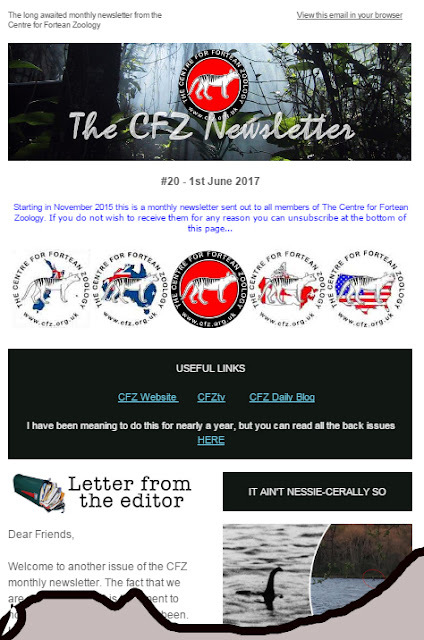 The most recent (which went out a few minutes ago) included articles on Loch Ness sightings, The Bonzo Felix, a mysterious "lizard cat", a new book on vampires, a mystery invertebrate from from Hong Kong, CFZ in the news, the return of OTT, Expedition Profiles for 2017, Notes and Queries etc. Now is, once again, time for all good folks to come to the aid of the party. 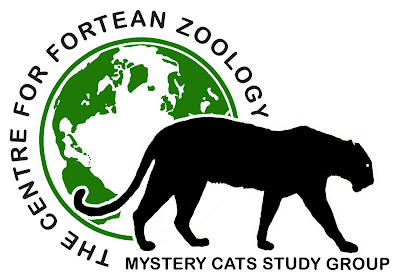 In this context, the good folks are the readers of this blog, and the party is the CFZ. As you may well be aware, life has not been easy these last few years. We, for numerous reasons, have lost various volunteers who used to help us out. We are in desperate need of proof readers. We can’t afford to pay you, but you get a free copy of the book a credit in the book, and our eternal gratitude. Is there anybody out there who wants to volunteer? THE GONZO BLOG DOO-DAH MAN JUST IS. EXISTENTIAL HUH? We truly seem to be in quite a productive phase here at the moment.There are all sorts of interesting things happening. This weekend's magazine is well underway, and I am editing the first episode of the relaunched On The Track. Gonzo have just released Tony Klinger's smashing novel 'Under God's Table' which is a political thriller that deserves to be mentioned in the same breath as books by Nelson deMille and Frederick Forsyth, and whilst on the subject of books, let me recommend Ronald Murphy's cracking new book 'On Vampires' which is available (inscribed) from http://www.ronaldmurphy.org. It truly is an outstanding book, and I urge you all tocheck it out.